Bringing the primary antagonists in the Syrian conflict to the negotiating table in Astana, Kazakhstan is already a massive result, political analyst Marwa Osman told RT. What is the importance of such a breakthrough meeting? The first result is having those both the main sides in the Syrian conflict sitting together. 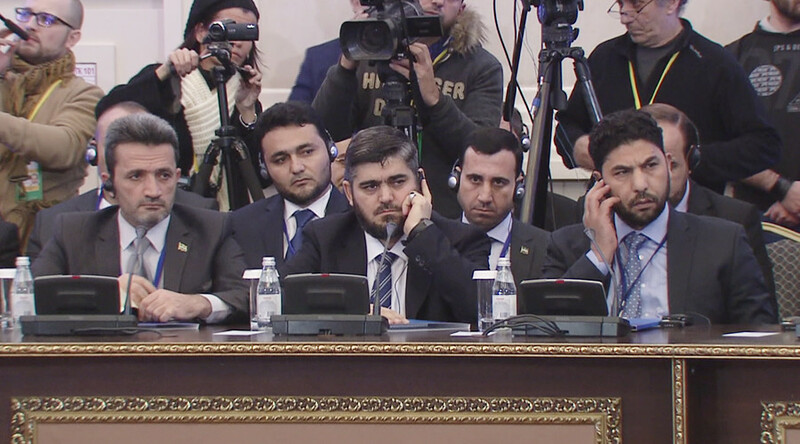 Talks between the Syrian government and opposition are taking place in Astana, Kazakhstan, as part of an initiative led by Russia, Turkey, and Iran. Major armed group Jaysh al-Islam is also involved in the negotiations. “The act of having them at the same table – that was a real new breakthrough, it was a huge deal, it was a huge result. This was the result of the meeting that we are now witnessing in Astana. The other thing is that we didn’t really know what groups would be there, who the leaders would be. And then we saw at the table the leader of Jaysh al-Islam [Abdullah] Mohammed Alloush himself. That was also another breakthrough,” she told RT. Just bringing these “main bickering sides” of the Syrian conflict to the negotiating table is already a result, the analyst said. “And then there is the actual talking behind closed doors,” Osman said. She explained that before the gathering many of the “attendees – whether it is Iranians, or the Russians, or the Turks – were a bit unsure” whether the Syrian government and the opposition would be meeting face-to-face. — RT (@RT_com) 22 января 2017 г. The analyst also suggested that now that the participants of the talks are known – that mainly refers to the armed opposition groups – “a fracture within the so-called mercenaries, or the opposition groups inside Syrian territory working against the Syrian Arab army” cannot be ruled out. For the first time, the opposition delegation in Astana also includes field commanders from the militant groups, as opposed to political representatives. That – according to Osman – offers a much better prospect for the negotiations compared to previous Syria peace talks, including those in Geneva. — RT (@RT_com) 23 января 2017 г. The Syria peace talks in Astana is the first chance of making some real progress from the situation during the UN-led talks in Geneva, or Vienna, or elsewhere, says Middle East affairs expert Ali Rizk. Rizk said there is a significance in Turkey taking part in the meeting as it has a “big influence” on Syrian opposition groups. “Turkey has a big stake in making these talks successful. So I do to see some positive developments in Astana. Everybody has an interest in making this process positive,” Rizk told RT. “Previously the political figures of the opposition had no influence on the ground in any way whatsoever. The commanders of the armed groups didn’t receive orders or refused to receive orders from those politicians living in exile, who say that they represent the opposition when indeed they don’t represent these armed groups – I don’t know who actually represents them. Some of them have close ties with Turkey,” Rizk said. — RT America (@RT_America) 21 января 2017 г. In Rizk’s opinion, having Ankara participating in the talks “is a very smart” diplomatic step taken by Moscow. “Vladimir Putin realized that if you really want to reach a solution, you have to have Turkey involved. It was kind of a bargain: involve Turkey and make some concessions. For example, we saw one of the Turkish officials – Deputy Prime Minister [Mehmet Simsek] in Davos saying that we can no longer insist that President Bashar Assad steps down. At the same time Turkey got one benefit, which was that the YPG, the Kurdish units are not represented,” the expert said. Russia had invited the US to the gathering, but Washington decided against sending a delegation to the Kazakh capital citing “the presidential inauguration and the immediate demands of the transition.” The US is represented at the Astana talks by the American Ambassador to Kazakhstan. It’s now “difficult to say” what action the Trump administration can take in terms of Syria. “Trump has expressed his interest in cooperating with Russia in Syria. At the same time, as you well know, Trump and his team are very hostile toward Iran. So I think if Trump finds that cooperation with Russia would strengthen Iran, I am not sure he would go ahead and fulfill his promises of cooperating with the Russians. We still have to see. Trump himself is very unpredictable person. You don’t know what steps he might take,” Ali Rizk said.